I have quite enjoyed this Library Read-a-thon and I finished quite a bit of reading of library books as well. Hope everyone else enjoyed the read-a-thon! 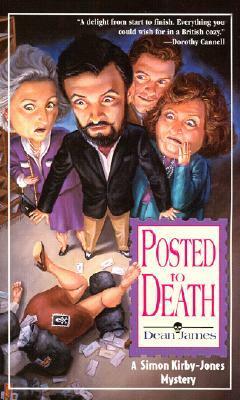 Now just a quick note about Posted to Death. This is a series new to me…however, I have read books by the author under another name, Miranda James. I found this series because I enjoyed the Miranda James’ A Cat in the Stacks Mysteries so much that I was looking for other books by “her”. I then found out Dean James writes under the names of Miranda James, Honor Hartman, and Jimmie Ruth Evans. So, there is lots to read by him. Anyway, Posted to Death was great! Funny, well written, full of quirky characters and a very interesting take on the traditional English village mystery. I wouldn’t call it a parody, just a humorous take on the paranormal cozy genre. The big twist is that the Dr. Simon Kirby-Jones, our sleuth is a man, just like in the Cat in the Stacks mysteries and he is also gay and a vampire. The character is done so well; I really enjoyed it. It could have been over the top bordering on ridiculous but it doesn’t go there. The other village characters are traditional examples of village life with secrets to hide and reputations to protect. Very much centered around village committee life and the small political battles that entails. That aspect reminded me of the BBC series Clatterford (US title) or Jam and Jerusalem (UK title). I will definitely read more in the series and more by Dean James in all his incarnations. This entry was posted in Book Reviews and tagged library, mystery, read-a-thon, review, vampire. Thank you for joining. I hope you enjoyed the read-a-thon.